Helpful Products There are 2 products. 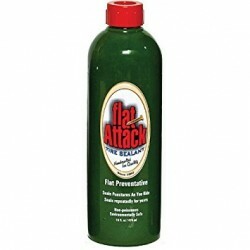 Flat Attack Tire Sealant Use in your tubes before a puncture - this product will keep your tires from going completely flat. 16 fluid ounces - Enough to do Front & Back tires on our Electric Fat Tire Bikes - 8 oz each tire.